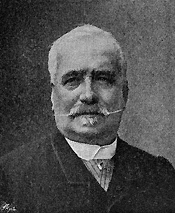 Charles Olivier de Penne was born in Paris on January 11, 1831. He received his formal art training under Léon Cogniet (1974-1880), the history and portrait artist, at the Ecole des Beaux-Arts and continued his studies with Charles Emile Jacque (1813-1894), the Realist and Barbizon painter. In 1857 de Penne exhibited Jésus et la Samaritaine at the competition for the Prix de Rome, winning the second grand prize; Jules Didier won first prize for his painting of the same subject. 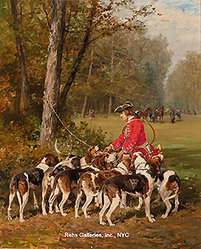 De Penne’s love of animals, especially dogs, and scenes of the hunt would be the driving force behind his art. A frequent exhibitor at the Paris Salon, he won the third class medal at in 1872 and the second class medal in 1883. 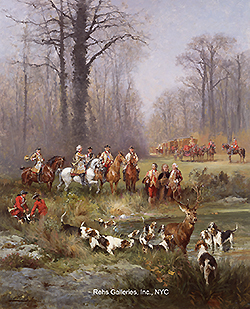 Among the paintings he exhibited at the Salon were: Norman Dogs and Cerf forcé, tenant les abois in 1875; The Cry of the Wild Boar and English Dogs in 1876; Dogs of St. Hubert and Fox Hounds in 1877 and English Dogs and Dogs of Saint-Germain and Skye in 1878. At the Paris Exposition of 1889 he, along with Daniel Ridgway Knight, was awarded a silver medal. During his lifetime, De Penne’s sporting and animal paintings were highly sought after by collectors throughout the world. He continued to exhibit until his death on April 18, 1897.